FC Köln vs. Bayern Munich is not traditionally one of the standout fixtures of the season. The two clubs are not local rivals and Köln do not represent a threat to Bayern’s dominance at the top of the table. Of course, it is always a big occasion for home fans when Bayern roll into town, but generally the majority of them dream of a famous result rather than expect one. The fixture itself this season was nothing spectacular, with Bayern securing a comfortable 2-0 victory courtesy of goals from World Cup Liebling Mario Götze and a Köln own goal. However, despite the routine nature of the result, this game caused a stir across the country and ensured column inches were filled. The reason for this was one man: Xabi Alonso. Against a newly-promoted Köln team the Spaniard gave a lesson in ball retention and distribution. Alonso was on the ball 206 times. Not only is this a Bundesliga record (previously held by team mate and fellow countryman Thiago Alcántara, incidentally), but it means that he touched the ball an average of once every 26 seconds. Having the ball is one thing, but making use of it another. When Alonso has the ball at his feet he doesn’t waste it. Over the 90 minutes against Köln he transformed these 206 touches into 175 successful passes; the entire Köln team, in contrast, managed just 159. It’s not exactly news that Xabi Alonso is a good footballer. After all, he was an integral part of Spain’s worldwide dominance and Real Madrid finally landing la Decima in Europe (albeit missing out on the final). And prior to returning to La Liga he was consistently one of the best midfielders in the Premier League whilst at Liverpool. So it’s also not big news that Alonso has turned out to be a success in Germany since swapping the Bernabeau for Bavaria in August. What is noteworthy however is the level of impact Alonso has had on the team, and the Bundesliga as a whole. When Guardiola signed him from Real Madrid it was seen as a shrewd bit of business. Although not getting any younger, Alonso had proven pedigree at the top level and would be an asset to any team. However, with Bayern’s squad already bursting with midfield talent many assumed he would be a rotation option, albeit a luxury one – the kind of player to kill off a game or to use against certain opponents. Just another component in Pep’s tactical machine. As it turns out Alonso has been a revelation. Barely a week goes by without experts, rival managers, players, pundits and the media swooning over the brilliant Basque. Despite the high profile signing of the long-coveted Robert Lewandowski from Dortmund, it is Alonso’s arrival that has inspired the Munich faithful. Football is a numbers game, and Alonso simply owns them. In only 15 Bundesliga matches this season he has made 1,524 passes, almost four times the average for his position. Of these passes, 1,362 have been successful. He had made over 500 tackles, this time double the average for his position. Where things begin to get dizzying are the statistics for ball contacts in a game. So far this season Xabi Alonso has touched the ball 1,773 times, eclipsing the league average of 567. In fact, his game average of 118 ball contacts translates to him having the ball at his feet roughly once every one and a half minutes. The ball gravitates towards him. His team mates know he is a safe option. When they look up, he is there – always available, his body language inviting a pass, ready to receive. He almost seems to pass the ball for them. In his position, this is nothing unusual. He is generally classified as midfielder – take your pick from defensive, holding, or deep-lying. Alonso is all of the above, and more. Alonso is omnipresent, unrestricted by position. After all, what is his position exactly? The fact is that, at Bayern, Alonso doesn’t have a position; he just plays. Of course, the team has a shape, but he drifts and scuttles around the field. He is influenced by the flow of the match and influences it simultaneously. He rides games like a champion surfer does a wave, adjusting position, speed and intensity accordingly. Analysing his heat maps in matches is like tracking the outbreak and spread of a deadly virus, creeping across a country. At Bayern, Alonso wears the number 3 shirt. Due to swelling squad sizes and player preference, the number a player has on his back rarely corresponds to his position on the park. Nevertheless, the number 3 is still very much associated with the left back. Alonso is neither left back nor defender. Certain numbers carry connotations of the player in the shirt. The numbers often define and inform expectations. We want our number 10s to be creative, quick footed, playmakers. A number 9 should be predatory, a number 5 solid and commanding. Superstars such as David Beckham and Cristiano Ronaldo have even managed to turn shirt numbers into brands. We automatically associate iconic figures with their shirt number. Without thinking, most people could tell you Del Piero’s number at Juventus, Giggs’ at United, Henry’s at Arsenal, or Raul’s at Madrid. Pundits and managers talk about suffering under the weight of the shirt, or meeting expectations of famous predecessors. Players speak of their pride at inheriting the shirt of a club legend. Squad numbers are even retired as a sign of recognition or respect – or in some cases as an act of mourning. Alonso wears number 3, but he is not a left back. The truth is the number on his back is irrelevant. If players were still defined by the numbers they wear, then Alonso would have to run to the sideline every five minutes to change his shirt. In any given game you will see him performing a number of roles, whether it be sitting just in front of the centre backs and sweeping up trouble, breaking up play in the middle of the park, offering an out ball to the left back, operating as a left back, springing the oppositions offside trap with a through ball to a forward, or switching the play with a long diagonal. What you will always see is Alonso with his head up, constantly in flux, surveying his surroundings. All great players seem to have more time on the ball, regardless of how many opponents are in near proximity, and Alonso encapsulates this. Selected critics remain unconvinced by some teams’ ‘death by passing’ tactics, arguing that just passing for the sake of it is little more than time-wasting. There may be some truth in this and continuous 3-yard passes back-and-forth between centre backs and midfielders often draw collective groans from frustrated fans. After all, the back pass rule was introduced for a reason. Still, there is more to what Alonso does than that. It is neither tiki-taka nor total football. It’s also not just about playing keep ball. Xabi Alonso recycles possession. Better said, he upcycles – taking the ball from a team mate or opposing player, and turning it into something more, increasing its value. He brings the team forward, manufactures space for those around him, relieves the pressure from a defender, or creates a chance to score. He is able to dictate games and control the tempo. Not only does he provide options for his team mates, but he also allows the team a certain fluidity. Other players can cease on opportunities to fly forward safe in the knowledge that Alonso will plug the gap they leave. 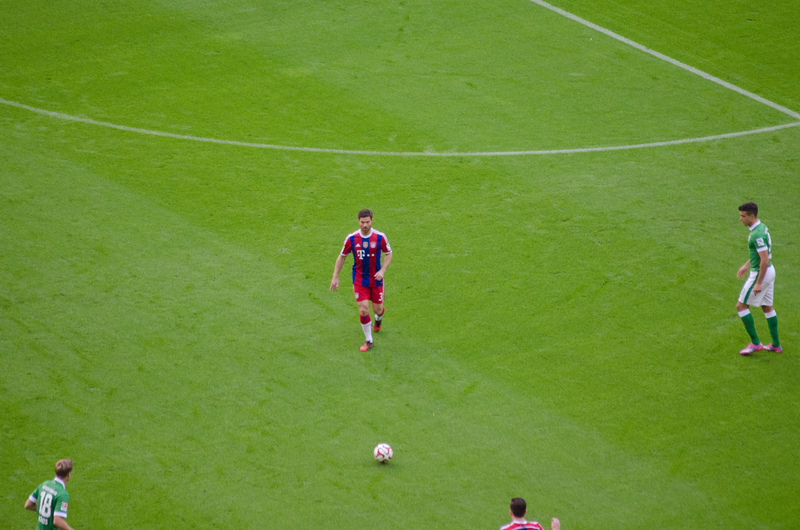 With players like him in the team Bayern can drift around the pitch in tidal motions unbound by formation. Credit for his performances cannot go to Alonso alone. Pep Guardiola has shown himself to be an advocate of fluid formations, for favouring teams of footballers comfortable on the ball in any area of the pitch. Guardiola teams rarely panic under pressure. It should also be said that Alonso is also not the only player able to perform this role. You could probably kick a ball into the Spanish dressing room and hit someone who could do a similar job. However, in his brief time in Germany, Alonso has already begun to raise the bar for the modern midfielder. He has added another dimension to an already multifaceted Bayern team. He plays without a clearly discernible position, but with obvious influence. Alonso’s numbers may be making waves in the Bundesliga, but the one on his back neither defines nor restricts him.